Aspen completed a joint EIR/EIS for the California State Lands Commission and the Monterey Bay National Marine Sanctuary on a unique undersea scientific observatory proposed by the Monterey Bay Aquarium Research Institute called the Monterey Accelerated Research System (MARS) Cabled Observatory. The project consists of a science node located at the end of 31.7 miles of submarine cable extending into Monterey Bay from the shore. The first 0.89 miles of the cable were installed from shore using horizontal directional drilling and the remainder of the cable was installed by a cable-laying vessel towing a hydraulically operated cable plow. The project provides real-time communication and continuous power to suites of scientific instruments enabling monitoring of biologically sensitive benthic sites and allowing scientific experiments to be performed. The project also serves as the engineering test bed for future cabled observatories. A primary issue of concern addressed in the EIR/EIS was the effect of cable-laying and operation on the local fishing industry. Other issues examined in the EIR/EIS included air quality impacts from cable laying and HDD, effects on marine water quality, impacts on marine organisms and hard bottom habitat, cable-laying impacts on marine mammals, effects on marine traffic and navigation, and effects on coastal resources, including recreation and access. The local commercial fishing industry raised concern about the potential for the project exclude them from fishing areas during installation and operation of the cable and science node. In addition, the fishing industry was concerned about snagging equipment on the cable or science node while trawling along the sea floor. To address these concerns, the Aspen Team conducted research and characterized the local trawling activities and compared that against statistics on equipment losses to determine both the likelihood of gear loss from a snag and the economic effect on commercial fishing in Monterey Bay. A Fisherman’s Agreement was presented as mitigation to establish a mechanism for reimbursing fishing operators if fishing gear or catch were lost due to a snag. 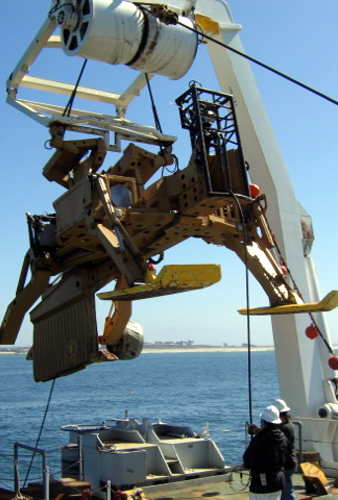 Aspen also monitored the cable-laying operation and installation of the science node.